← New “Music Animator” & 2 invitations! 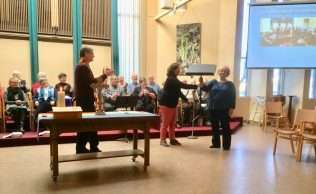 With heartfelt appreciation for the time that Rachel Casponi led our KUC choir and music program and with a warm welcome to Cindy Darwin, our new music animator, the congregation clapped enthusiastically! There was a cake of thanks for Rachel and a cake of welcome for Cindy at Coffee Time after the service.